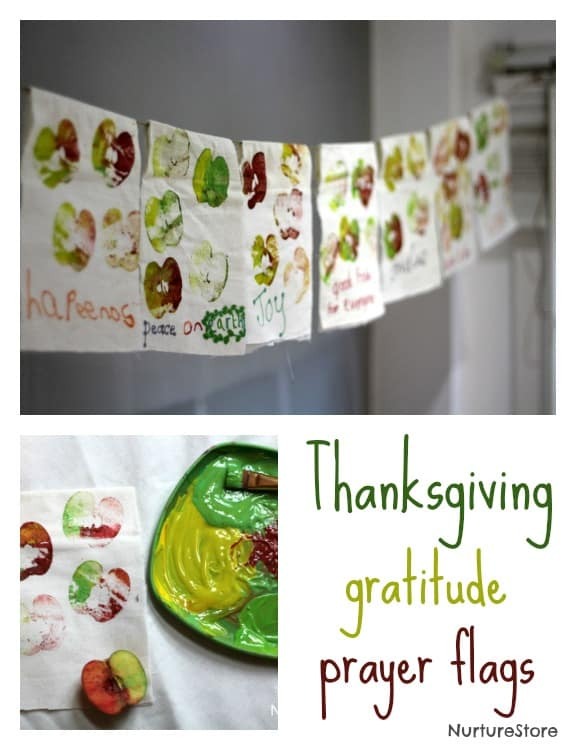 Here’s a Thanksgiving craft for kids that’s fun to make, looks beautiful and sends out positive wishes to the world: Thanksgiving prayer flags. We are big fans of bunting in the Nurturestore household, and we’ve also recently been learning about Tibetan prayer flags. 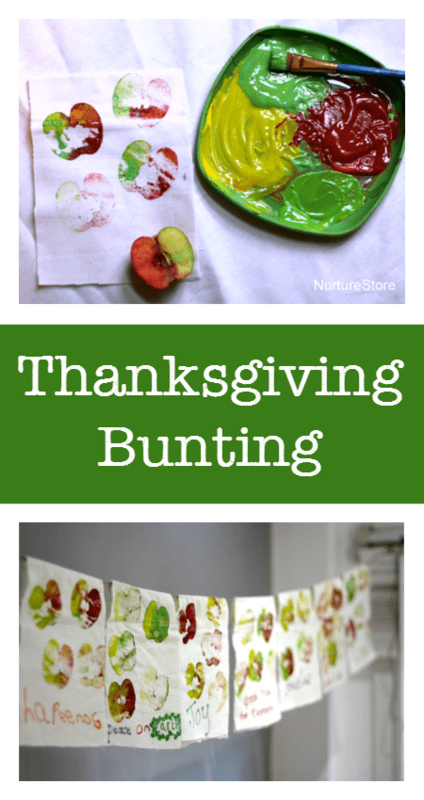 This craft combines the two to create some thoughtful, Thanksgiving decorations. Tibetan prayer flags can be seen blowing in the wind across mountains and from roof tops. Usually in the five traditional colors of blue, white, red, green, and yellow, they symbolise the five elements of sky, air, fire, water and earth. 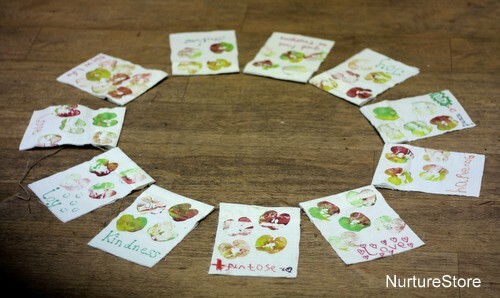 They are decorated with drawings of symbolic creatures, mantras and prayers, and are believed to release their goodwill and blessings out across the world. 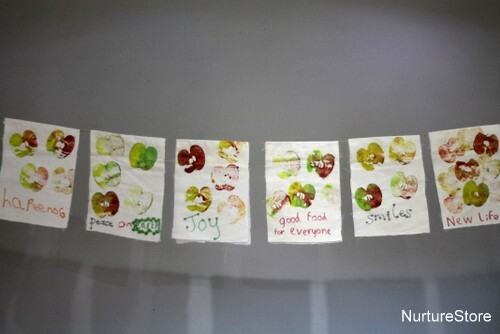 For a version of the prayer flags that matches the season of Thanksgiving we made a set of flags using apple prints, decorated with words of gratitude and good wishes. We used an old curtain to make our prayer flags, cutting out rectangles to make the traditional flag shapes. 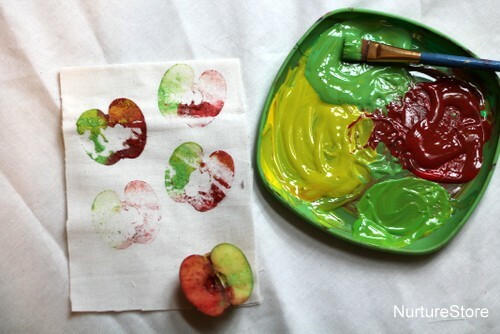 We used green, yellow and red paint and mixed them together to create some custom shades that matched the colors of the apples we were using. 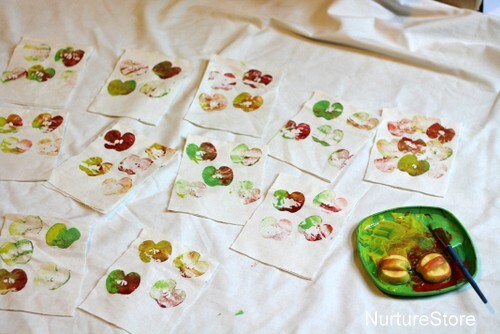 Then we used the apples to print shapes on fabric. 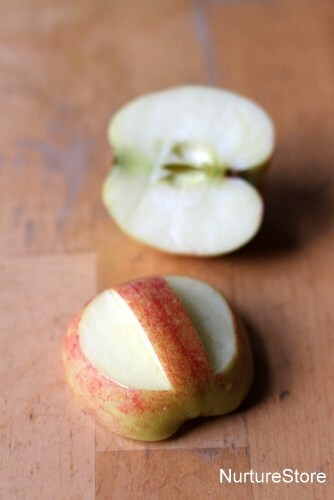 Cutting a little handle in the top of the apple half makes it a lot easier to hold. 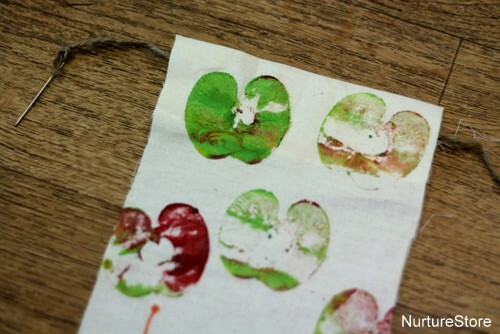 You can choose your type of paint to suit your plans for the bunting. We are making our flags to be hung indoors and used poster paint (tempera). For a more permanent result, particularly if you want to hang your flags outdoors, you might be better to use fabric paint. The Tibetan prayer flags are made to be hung outside in the elements, and are expected to last a couple of years before the designs begin to fade and the fabric begins to fray. This natural process returns the flags into the environment, taking their good wishes and blessing with them. Once the paint had dried, we used permanent markers to write words on each flag. You might like to think about things you are thankful for, blessings you want to send out into the world, or prayers you want to say for others. We used some garden twine to string our prayer flag together. Tying the end to a blunt needle or attaching it to a safety pin will make it easier to thread the sting through. We were fortunate that our curtain already had a wide seam along one edge, so no sewing for us! But if you are using other fabric, you may need to fold over one edge and glue or sew it in place – or just sew a running stitch right across the top of each flag and along to the next one, to join them all together in a chain. Traditionally the Tibetan prayer flags are hung horizontally, with one end tied and the other loose so the flags can blow in the wind. 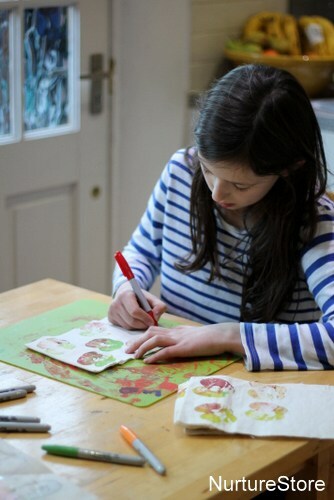 We are hanging ours in our kitchen, over our dining table, in a more typically ‘bunting’ style. Made this with my 2 1/2 year old today. Loved the process and the finished result. 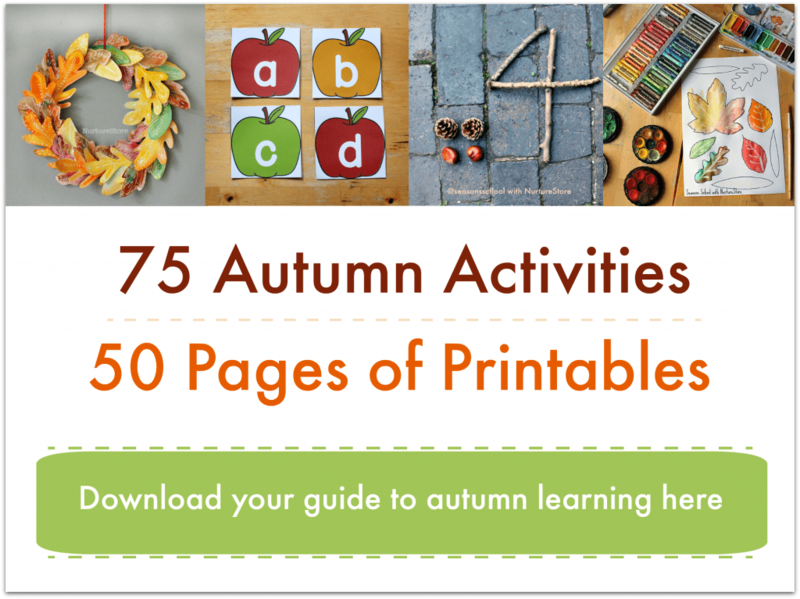 I love crafts that we can create together.